The Evolutionary Education® Yoga Psychology Teacher Training (YPTT) is an integrative and innovative program designed to cultivate or compliment your yoga, teaching and/or clinical practice, though it may also serve as the foundation for your greater, transformational journey. Our course focuses on developing skills and philosophies for healthy, inspired living and leadership throughout one’s lifetime, and building supportive community to help foster positive, social and ecological change. 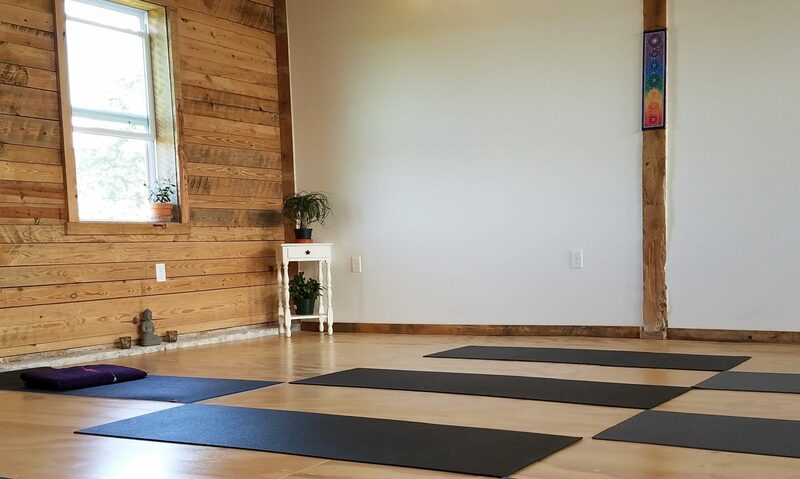 Days 1-14 of the training (including one off-day on Day 10) will be held at the beautiful, Anahata Education Center in Floyd, Virginia. Your tuition includes healthy and delicious, organic lunches and light snacks at Anahata on all training days during this period. 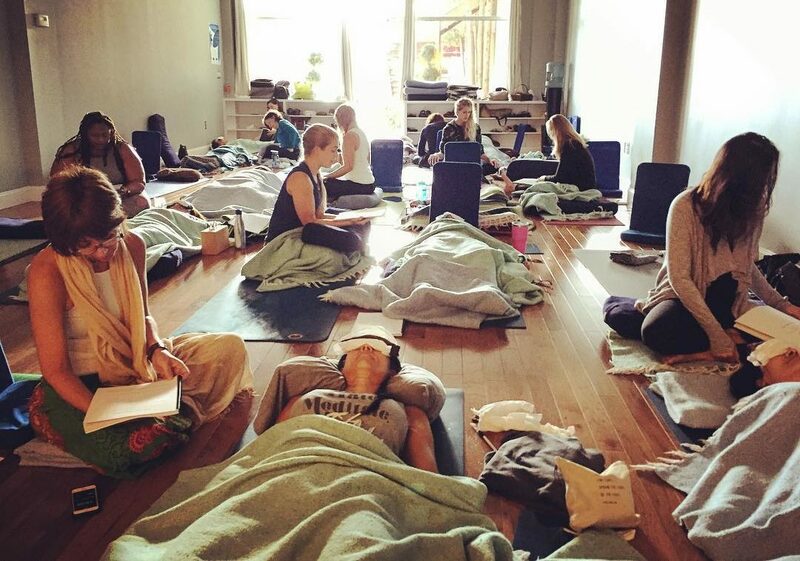 Days 15-18 will be held at the Floyd Yoga Jam in nearby Willis, Virginia, where you’ll have the unique opportunity to attend both public and private classes taught by a number of highly-respected instructors, in addition to completing your seva (volunteer) requirement. On Day 18, we will conduct our closing ceremony and graduation at the Yoga Jam. The training totals 180+ hours face-to-face, in addition to a minimum of 20 hours of “at-home” study (which you’ll complete during the Intensive). Regardless of where you stay, you will be responsible for all other meals, including on your off-day and during Floyd Yoga Jam. Camping at Floyd Yoga Jam is included in your tuition, though you must provide your own camping gear (tent, sleeping pad, sleeping bag, etc.). While you are encouraged to camp with the group at the festival, you are welcome to stay off-site and commute, though you must arrange your own travel to and from the site during this time as well. Join Our Growing Network of Teachers. In addition to receiving your 200-hr certificate of completion upon successful fulfillment of the course requirements, you will also gain access to the Evolutionary Education® Teacher’s Community Facebook Group and may list yourself on the Evolutionary Education® Teacher Directory. The course is currently registered with Yoga Alliance. Upon completion of the training you may register with Yoga Alliance as an RYT 200, which will enable you to teach yoga and meditation internationally. For an application, please visit the Yoga Alliance website. **All fees represent your total cost of tuition, including a non-refundable and non-transferable, $300 application fee per course. (Your deposit will be returned if you are not accepted into the course.). Please note that if paying by PayPal, you will also be assessed an additional 3% processing fee per transaction. **Refer a friend and save $100 off of your tuition. **Notice for All Potential Applicants: In order to create a positive experience for everyone involved, each YPTT course needs a minimum of seven participants to proceed. If we do not meet this minimum within one week of the start date, we will refund your application deposit and any additional fees in full. In the event of a serious illness, a death in your immediate family, or inclement weather before the training begins, you will be refunded for the amount you paid including the $300 deposit. In the event of an unforeseen cancellation on our end, you will also be granted a full refund including the $300 deposit. In the event of a serious illness, a death in your immediate family, or inclement weather after the training begins, and you need to completely drop out of the training, you will have the option to transfer your remaining balance to the next Evolutionary Education® 200-Hour Teacher Training. If you are not able to attend the next training, or any future training, due to one of the three reasons above, you will be refunded a prorated amount based on the number of days you were in attendance, less the non-refundable $300 deposit. No refunds will be given for any other reason, other than the three reasons above, once the course begins. In the event that circumstances require you to drop out of the training, you may transfer your registration to the next Evolutionary Education® 200-Hour Teacher Training within one year of your initial training. If you need to transfer due to a serious illness, a death in your immediate family, or inclement weather, we will transfer your registration free of charge. If you decide to transfer for any reason other than the three listed above, you will be charged a transfer fee of $150. If you are on a payment plan and you need to drop out of the program, your remaining balance will be pro-rated as outlined below. No refunds will be given for payments already received. You may continue to pay in monthly installments until the remaining balance due is reached. You may also continue where you left off at the next Evolutionary Education® 200-Hour Teacher Training. Your payments will be applied to the next training, with the addition of the $150 transfer fee. **If sending by mail, please include your name, phone & email or completed application form along with your deposit. In order to honor the unique perspective that each participant brings to the group, the YPTT is largely co-creative. While each session has a specific theme, there is a general curriculum in place and all students receive a 150+ page training manual. Though some lesson plans are “fixed,” many sessions embrace going with the flow, which helps to sustain both a dynamic learning environment and a welcoming, retreat-like atmosphere. We do our best to draw from a wide breadth of yogic styles, but you should anticipate a strong emphasis on meditation, breathwork, and working with subtle energies vis-à-vis the Tantric/Kundalini yoga tradition (though we are not affiliated with the 3HO Kundalini Yoga organization), as well as ample opportunities for self-directed study and teaching practicum. The course also draws from humanistic and transpersonal psychology, incorporating elements of counseling theory and trauma-informed, evidence-based approaches to wellness and prevention. While the course caters to everyone’s needs and is open to participants of any age, race, gender, creed, and prior experience, it is especially suited for helping professionals (e.g., counselors, social workers, psychologists, nurses, etc. ), educators, parents, spiritual seekers, young adults and those going through transitional periods in life. 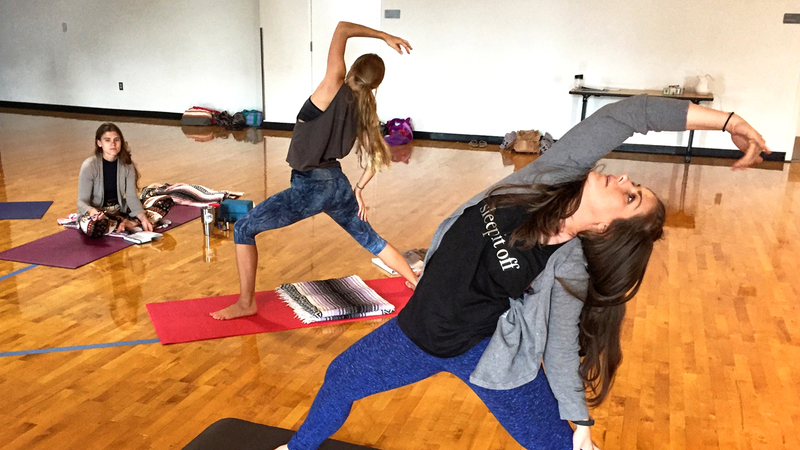 Though you will learn how to lead a variety of yoga classes (all of which may be tailored to suit your specific areas of interest), it is not required that you teach yoga following the training—we’re more interested in helping you live yoga and share it with the world via leading by example. Authentic Yoga for Contemporary Life. 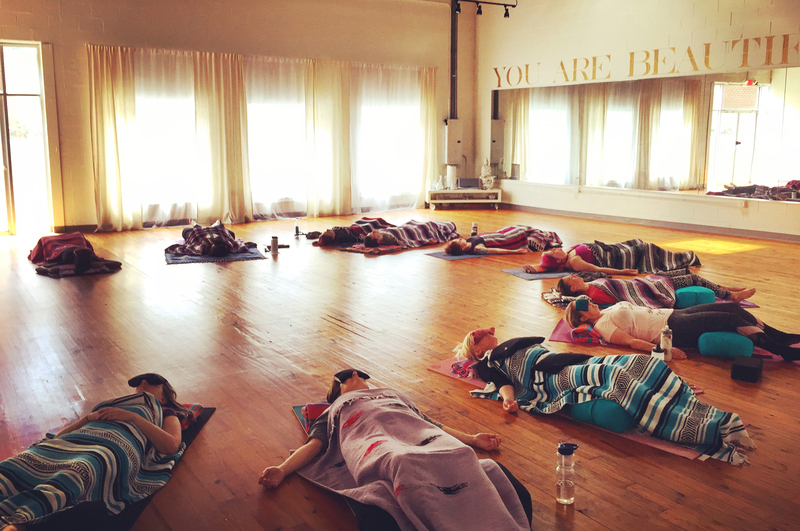 This life-changing course is grounded in traditional Indo-Tibetan Hatha Yoga yet incorporates over 30 years of combined experience in the healing arts and psychospiritual investigation. In addition to furthering your knowledge of yoga asana (physical postures), teaching methodology, and anatomy & physiology, you will learn the major theoretical tenets of yoga psychology, including the history of yogic thought and approaches to transformation, as well as a variety of in-depth, experiential techniques so as to create an embodied philosophy. As a natural complement to yoga psychology, expressive arts (e.g., singing, dancing, art-making, etc.) are interwoven throughout the course as a means to facilitating a meditative, community-oriented and positively-charged environment conducive to growth and self-discovery. Though the format varies from course to course, below is a sample schedule, keeping in mind that there is considerable variation in course content from day to day. All sessions will begin on time but may extend a few minutes beyond the end time as needed. Short breaks are woven into the sessions roughly every hour. Please do your best to clear your schedule on class days in order to facilitate maximum flexibility. Yogic Philosophy incl. History, Morals & Ethics, etc. When all of the above is achieved, you will be certified as an Evolutionary Education® Yoga Instructor. At the start of the program you will be asked to sign a written agreement detailing your responsibilities as a student and the standards used to assess your eligibility for certification. Evolutionary Education® reserves the right to revoke your certification at any time if it is deemed that your conduct is in violation of the code of ethics or the standards befitting a yoga instructor within our organization. Reserving your spot is a simple 2 step process!